Welcome to Symbiosis Institute of International Business (SIIB) !! In the rapidly changing economic and business landscape, need for managers with the global perspective and understanding International Business has become even more important for modern day organizations. SIIB established in 1992 is one of the premier B-schools in India which caters to these needs of the business by offering global focus in specialized fields such as International Business, Agri-Business and Energy and Environment under one umbrella. At SIIB, the core strength has always been structuring and delivery of the new age courses that are drawn up with inputs from various industry experts and academicians. This process makes the students of SIIB job ready and helps them to face the challenges of the corporate world from day one. We at SIIB always take pride in two things, first our International affiliations with various World-class Universities such as Berlin School of Economics and Law, Germany, Hochschule Bremen, University of Applied Science, Germany, Sheffield Hallam University (SHU), UK, Hochschule Reutlingen University, Germany and Flensburg University of Applied Science, Germany. And second, a strong presence of our illustrious alumni working all across the globe in prestigious organizations earning tremendous amount of respect and recognition through their sheer hard work, knowledge and commitment. So, come and join us at SIIB to get a unique learning experience which will act as a catalyst in honing your conceptual knowledge and giving you an additional professional skill set to conquer the business world outside! Dr. Asmita Chitnis is a Post Graduate in Statistics and holds a Ph.D. degree in the field of Operations Management. 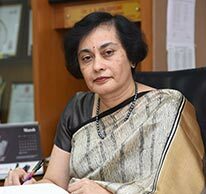 She started her career with National Institute of Bank Management (NIBM) as a researcher and has worked on different projects of Reserve Bank of India (RBI) during this tenure. Later, she moved into teaching and has more than 26 years of academic and corporate training experience to her credit. Dr. Chitnis has been associated with National Institute of Bank Management (NIBM), National Insurance Academy (NIA), Open University of British Columbia (OUBC) and many more as Educator and Marker. Her research interests include Performance Evaluation, Benchmarking, Forecasting, etc. and have published papers in these fields of management.